Real Life LEED: Where Do Primers Fit in the VOC Limits? CORRECTION!!! HUMBLE PIE SERVING NUMBER 2!!! Primers must meet the limit for NON-FLAT paint with a 150 g/l VOC max. Alert reader Josh Greenfield once again has pointed out something I missed. He was smart enough to search through the latest LEED-NC Reference Guide Errata Sheet (page 11), where it definitively states that primers are to be considered non-flat paints. If I had been so smart this would have been a much shorter post. Due to the corrections some of the unecessary portions of the original post has been removed. The 2nd edition of Green Seal Standard GS-11 calls for a 100g/l limit for non-flat paints. 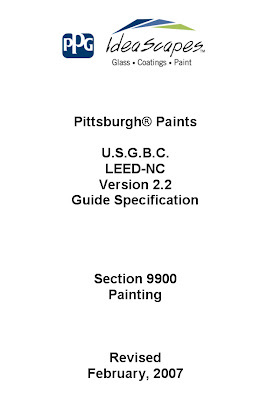 Do you think it's safe to assume the 2003 edition limit of 150g/l for non-flat paints still stands until the USGBC updates the requirement? GS 03 rule refers to anticorrosive coatings without specifying if primers are included. In SCAQMD rule, a primer is defined as a coating. Can we assume that the limit of 250 g/l for anticorrosive coatings can also be applied for anti-corrosive primers ?